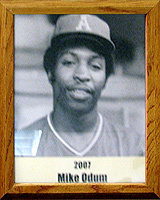 Mike Odum was one of Arizona’s best high school baseball players in the early 1970s at perennial power Tucson High School, Mike earned three varsity letters, was All-City in 1971-72, All-State in 1972 and All-Southwest in 1972 as Player of the Year. He was an All-City and All-State football player in 1972. Mike was drafted in the seventh round of the pro baseball draft by the Houston Astros but went to college instead. At Azusa Pacific University, Mike was on the All-Conference NAIA team in 1976. Mike played pro baseball for the Cincinnati Reds and Texas Rangers minor league organizations from 1976 to 1978. Before high school, Mike played Little League, Colt League, American Legion and Pony League and made all-star and all-tournament teams each season. Mike also has been a successful baseball coach. He was the field manager for the Nogales Charros of the Arizona-Mexico Independent League in 2003, pitching coach at Pima Community College, an American Legion coach and head coach at Cholla High School from 1990 to 1994. At Cholla, Mike earned a Coach of the Year honor and coached in the Arizona High School All-Star Game. Mike has worked as a scout for the Tampa Bay Rays and Cincinnati Reds. He was also involved with establishing the Reviving Baseball in the Inner City program (RBI) in Tucson and currently serves with the El Rio Neighborhood Health Center on the board of directors as well as being chairman of the Labor Management Committee.